A monumental strike by about 1,000 teachers from three privately-owned primary and secondary schools ended Monday, November 9, when the government intervened and temporarily took over management at one of the schools. The teachers began their strike Thursday, November 5, with the support of many students and parents, for improvement of teachers' salaries, benefits, work conditions, and school facilities. Although the teachers have gone back to work, they are still negotiating with the owners, now through the arbitration of the government and with input from parents. Mid-term exams were scheduled to begin today. They began as scheduled at one of the schools and are expected to begin tomorrow at another. Yesterday the schools' owners told parents that the dispute had been resolved and the students must return to campus and take their exams today. They also reportedly told the teachers that their phones were being monitored and they would be fired if they notified students that the dispute had in fact not been resolved. The owners claimed to have enough replacement teachers available to cover for any teachers who are fired, and at least some of the teachers believe this. Police and hired thugs were also stationed outside one of the campuses since Sunday, according some reports. The schools - CFLS (Chengdu Foreign Language School, a secondary school), CEFLS (Chengdu Experimental Foreign Language School, also a secondary school), and CFLS Attached Primary School, all located in Pi County about an hour outside Chengdu city proper - were founded by the government and purchased in 2002 by the Derui Group (德瑞集团), chaired by Yan Yude (严玉德). Yan is currently worth 220 million US dollars and ranked the 698th richest person in China by Hurun, 2009. Derui also deals in real estate development, transportation, and medical services, and is preparing to list on China's stock exchange. The strike erupted at 14:00 Thursday when negotiations broke down between teachers and management at CFLS, and had spread to the other two schools by that evening. The teachers say they haven't been given a raise since the school was bought in 2002, despite high inflation and raises for teachers at public (state-owned) schools. Teachers' salaries at CFLS range from 800 to 4,000 yuan per month (117 to 586 US dollars), with an average of 2,000 yuan (293 US dollars), whereas 4,000 to 5,000 is now common for teachers at public secondary schools. 650 is the legal minimum wage in Chengdu, but 1,000 is popularly considered the real poverty line, with at least 2,000 necessary to support a family. Moreover, retirement pensions at Derui-owned schools have not improved in line with public schools, and maternity leave was actually reduced from six to two months, with a stipend of only 400 yuan. Teachers also complain increased workloads are affecting their health. The three music instructors at CFLS say they have developed throat problems from teaching singing to many of the 4,800 students. Parents pay between 16,000 and 26,000 per year in tuition (with 116 students in a special program paying 60,000), plus high fees for food, lodging, and books, whereas public schools do not charge tuition for students from their districts, and charge considerably less than private schools for students from other districts. Despite these high fees, students and teachers at CFLS and CEFLS complain that the facilities have deteriorated since Derui's takeover in 2002, with rats and cockroaches in the unheated dormitories and insects in the low-quality food. 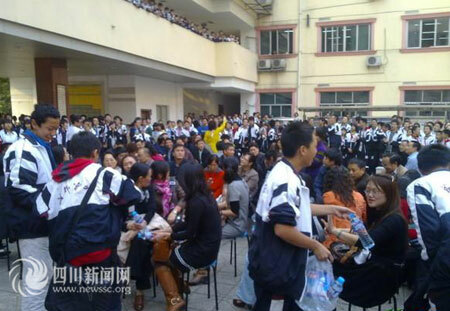 This seems to have been the first teachers' strike in China in many years, and the first involvement of secondary-school students in an action against school authorities. On the first day of the strike, students at CFLS grew excited and tried to support the teachers assembled in the courtyard by bringing them water and turning off the speakers broadcasting commands to return to class. Some teachers became wary off the students' rebelliousness, perhaps thinking of the Cultural Revolution, when, for several years, students at secondary schools throughout the country followed the lead of university students in rebelling against teachers and parents alike. But at CFLS, the main immediate concern of teachers was to avoid angering parents. The teachers signed a collective letter to the parents apologizing for interrupting the students' studies, offering to teach make-up classes free of charge. In interviews and online comments, most of the parents seem to have supported the strike. For centuries, teachers have been highly respected in China, with examinations being the path into officialdom in late imperial China. After the establishment of the People's Republic in 1949, teaching came to be widely regarded as a job like any other, but since the reforms beginning in 1978, some of the traditional mystique of education has returned, which has in part contributed to the willingness of teachers to accept relatively low salaries and often unreasonable or even abusive treatment by school officials. University students and some professors have been active in various forms of rebellion since the birth of modern universities in China at the start of the 20th century, but rarely have these rebellions concerned work conditions or salaries, and rarely have they occurred at secondary schools. Since 1989, students and education workers have been generally passive, the only major actions being several student riots against tuition scams at private colleges over the past few years, patriotic protests against US imperialism in 1999 and 2001, and volunteer efforts to help victims of the Sichuan earthquake last year. This banner from the strike at CFLS reads "Ensure the legitimate rights of educational employees according to the law"
Great article, thank you for posting. (On a subbing note I just made a very brief change, which were shortening the "intro" field - this should be kept as brief as possible. Also, if you wish to post multiple images you can use the "file attachment" link at the bottom in order to attach pictures and then link to them like you have the ones above, but without the danger of them being taken down from elsewhere on the net). On a result of the strike, is this seen as a victory then? Ie did the government takeover in order to make some of the changes demanded by the strikers, or have they just taken over to get the teachers back to work? Whoops, turns out those photos are actually from CEFLS, not CFLS (from here) - someone just corrected me. No, not a victory. A student I talked to seemed to be disappointed in the teachers, saying they "backed down." The teachers say they're still negotiating with the owners, but its hard to imagine they will get very far without striking again. Maybe they're just waiting until after the exams. Not sure how the government involvement will change thing. On Thursday, the strike began when the company refused to give more than a 1,000 yuan pay raise, and it hasn't improved on that offer as of this morning.